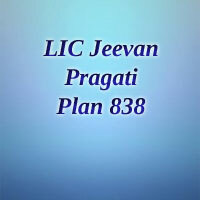 LIC Jeevan Pragati (Plan 838) is a non-linked, with – profits endowment plan. Jeevan Pragati endowment plan provides an attractive fusion of protection and saving features. LIC of India recently introduced a new endowment plan Jeevan Pragati with effect from 3rd February 2016. New Endowment Plan Jeevan Pragati provides the automatic increase in risk cover after every 5 years during the term of the Insurance policy. Also, this new LIC Plan also takes care of liquidity needs through loan facility. The new UIN (Unique Identification Number) for LIC’s New Jeevan Pragati plan is 512N306V01. Jeevan Pragati Endowment Plan offers financial support for the family in case of unfortunate death of the insured any time before the maturity and a lump sum amount at the time of maturity for the surviving Insured. LIC New endowment plan-Jeevan Pragati can be suitable for an individual who is looking for saving as well as adequate risk cover as protection for their family. This New LIC plan helps you to do the things what you always have been doing. LIC of India offers various Endowment plans for individuals, Family, etc. Let us have the glance at the key features provided by the LIC Jeevan Pragati Plan (838) in the following section. LIC Jeevan Pragati is non-linked, with – profits endowment plan. New LIC Endowment Plan Jeevan Pragati is a combination of Protection and savings need. The Accidental Death & Disability Benefit Rider (UIN: 512B209V01) offered by LIC India is available under this plan as an optional rider. The life assured will receive a lump sum Amount on Maturity of the Policy. LIC Jeevan Pragathi endowment plan is the ‘sum assured on death’ automatically increases after every five years during the term of the policy. Death Benefit: Sum Assured on Death” is higher of 10 times of annualized premium. LIC Jeevan Pragati endowment plan offers customized policies that can surround almost any Saving need that insured might have. Check the eligibility conditions for the Jeevan Pragati Endowment plan in the following section. Maximum 45 years (Nearest Birthday). Available on payment of additional premium. LIC Jeevan Pragati endowment plan provides a reliable tool for increasing funds and offers a life cover to the life assures. Here we are presenting the essential benefits of endowment (New LIC Plan 838). Let’s have a look at the benefits offered by the LIC endowment plan in the following section. Death Benefit: On decease of the Insured during the policy term, a Death Benefit which is Sum Assured on Death + Final Additional Bonus + Vested Simple Reversionary Bonuses, if any, shall be payable to the beneficiary. The Sum assured on death automatically rises every five years. Where “Sum Assured on Death” is defined as the higher of the following. 10 times of annualized premium. Absolute amount assured to be paid on death, which is as follows. During the first five policy year: 100% of the Basic Sum Assured. During 6th to 10th policy year: 125% of the Basic Sum Assured. During 11th to 15th policy year: 150% of the Basic Sum Assured. During 16th to 20th policy year: 200% of the Basic Sum Assured. Free Look Period: If the policyholder is not satisfied with the “Terms Conditions” of the LIC Jeevan Pragati plan, she/he may return the insurance policy to the Corporation within 15 days from the date of receipt of the policy. Maturity Benefit: If life insured survives till the end of the policy term, “Sum Assured on Maturity” which is equal to the Basic Sum Assured + Simple vested Simple Reversionary Bonuses + Final Additional bonus will be Payable as Maturity Benefit. Participation in Profits: By taking this Policy, the Life assured will receive Share in Profits of the Corporation as Simple Reversionary Bonuses declared as per the experience of the Corporation. Policy Revival: LIC’s Jeevan Pragati Plan can be revived before two years from the date of First Unpaid Premium (FUP). Loan: Loan facility is available under this plan after the Successful Payment of Premiums for at least Three Years. The Jeevan Pragati endowment plan present your financial security so that when your professional income starts to decrease gradually, you can still live with pride on your living standards without compromising. Under LIC Jeevan Pragati endowment plan an optional Accidental Death & Disability Benefit Rider (UIN: 512B209V01) is available. Get an idea about LIC Accident Benefit Rider in the following section. LIC Accident Death & Disability Benefit Rider: Under LIC Jeevan Pragati Accident Benefit Rider is available as an optional rider by payment of additional premium. In the case of accidental death, the Accident Benefit Sum Assured will be payable as lump sum along with the death benefit under the basic plan. This benefit Rider sum assured cannot overreach the Basic Sum Assured. Minimum of 18 years (completed). Maximum the Cover can have Opted at Inception or any Policy Anniversary after that. Maximum of an Amount Equal to the Basic Sum Assured Subject to Maximum of Rs. 100 Lakh Overall Limit was taking Existing Policies of the Life Assured. Let us check the New LIC’s Jeevan Pragati Endowment Plan Rebates here. If LIC Jeevan Pragati Policy completed under CEIS (Corporation’s Employee Insurance Scheme) will be eligible for the Rebate. Check the CEIS Rebate Rates. New LIC Jeevan Pragati Endowment Plan buying procedure is available here. Before purchasing the LIC New Endowment Plan- Jeevan Pragati, insured should read the Plan details carefully. The Client can get this New LIC Endowment Plan -Jeevan Pragati policy in two ways either online or offline. For Online mode, refer the LIC India Official Website. For offline mode, Visit the nearest LIC Branch Office or Contact an LIC Agent of superior guidance. Get the documents required for the LIC Endowment Plan 838 here. Revised Proposal Form 300, 340, 360 / Application Form along with the Photograph. The life assured can claim the Jeevan Pragati Endowment plan 838 offered by LIC, India after the completion of the policy period. In the case of eventual death of the policyholder, the nominee can claim instead of the Life assured. Let us have a glance at the documents required for Claim the LIC Jeevan Pragati Endowment Plan here. LIC Jeevan Pragati Premium Calculator is used to calculate Premium amount for yearly, half-yearly, quarterly and monthly of any Policy. This LIC calculator is used to estimate the benefits offered by the Jeevan Pragati Plan. Jeevan Pragati endowment Calculator provision helps you to calculate the premium amount and amount paid to the insured (or his/her family) after maturity. For more details regarding LIC Jeevan Pragati Premium Calculator, additional information refers, www.policybook.in. LIC Jeevan Pragati Plan 838 Maturity Calculator helps insured to calculate the maturity amount. The Maturity amount is the amount that is payable to the policyholder during the maturity time. Maturity value is calculated based on previous year Bonus Rates. Along with Bonus rates LIC Jeevan Pragati Endowment Plan Premium and Maturity Calculator uses some other parameters like Sum Assured (SA), Final Additional Bonus (FAB), etc. These are not exact amounts you will receive. But you will receive approximate or nearby maturity amount in this LIC Jeevan Pragati 838 Plan Maturity Amount Calculator. Following are the required details to calculate maturity. The Guaranteed Surrender Value, which is equal to the total premiums paid along with the Surrender Value of Simple Reversionary Bonuses, which is equal to Vested Bonuses multiplied by the Guaranteed Surrender Value factor applicable to vested Bonuses, will be Payable. LIC Jeevan Pragati Maturity amount after 20 years if i invest for 200000, what will be my premium quaterly and after maturity total return.